Bike advocacy is a sweeping term that captures a huge array of work. Fighting for better bike infrastructure on neighborhood streets, building new mountain bike trails, organizing charity rides, lobbying elected officials and many other things fit under that rather large umbrella of advocacy. Some might see that diversity of advocacy issues as a problem–that lots of sub-interests competing for limited funding and public attention will curb success for all. PeopleForBikes sees that variety as a boon to bicycling in America. The national advocacy organization helps fund everything from protected bike lanes to mountain bike parks; lobbies government agencies and elected officials; partners with professional cycling teams; provides grant funding; organizes their own charity ride; and much more. They’re guided by the basic principle that the more people ride, the better bicycling will be for everyone, regardless of what type of riding they do. With over three decades of work in advocacy and bike racing, PeopleForBikes President Tim Blumenthal is a fitting leader. 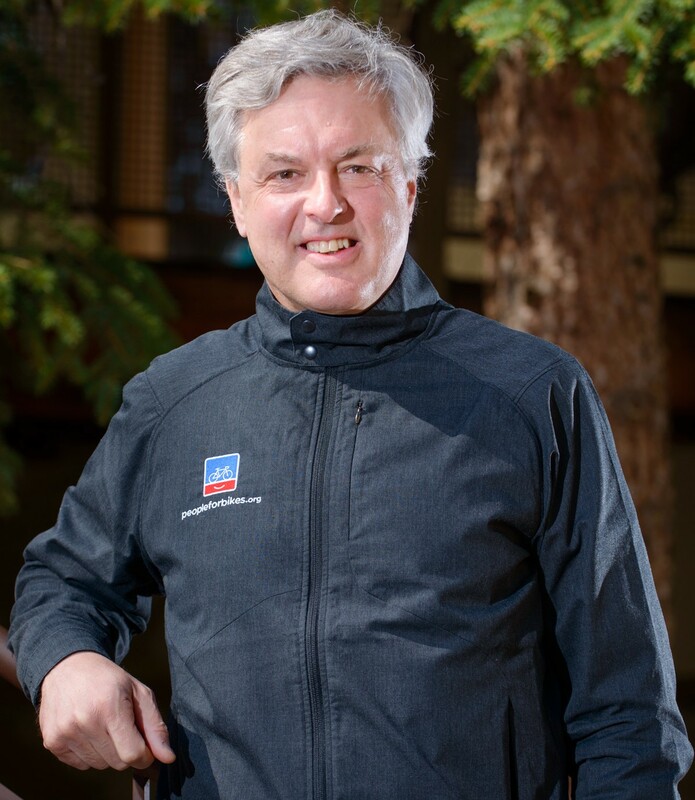 He got his start as a cycling journalist for publications such as VeloNews and Bicycling, worked with NBC on cycling coverage for seven Olympics, and spent 11 years at the helm of the International Mountain Bike Association before joining PeopleForBikes. I spoke to Blumenthal about PeopleForBikes’ work, his career in the cycling world, the value of combining cycling-as-sport and cycling-as-transportation in advocacy work, the strengths and shortcomings of American bike advocacy, and more. The mission of PeopleForBikes is to make bike riding better for everyone. The organization started in 1999 as Bikes Belong. At first we were pretty much focused on federal funding for better bike infrastructure. Since then we’ve grown probably 10 fold and expanded to do a lot of different things. But the three primary things are: improving infrastructure; making sure that the interests of bicycling are well represented and influential with government leaders, the media, and the public; and investing quite a bit of money–probably between $10 to $12 million–in the best projects and best organizations that benefit bicycling on road, off road, in cities, in the suburbs, and the country. We’ve had a special focus in the last three years on protected bike lanes in big cities. How did the organization get its start? This is my 11th year on the job. When I came on we started a lot of additional things. We formed a complimentary foundation that focuses on safe routes to school for kids, citizen involvement, and protected bike lanes. We’ve taken the burden of support off the shoulders of the bike industry. Now we get a lot of support from foundations, individuals, and corporations outside of the bike industry, which is great. As an organization we’re probably 10 times the size now than we were when I started in ’04. I know you have a long history in the cycling world. Was your entry into the bike industry as a cycling journalist? That’s how I got involved as a board member of IMBA, the International Mountain Bike Association. Eventually IMBA decided to form a professional staff so I became the first executive director and moved the headquarters to Colorado. That was about 21 years ago. I filled a lot of different roles in my time there. It was a lot of fun and a real challenge. Then Bikes Belong came to me and said they wanted to take their organization to the next level and can I do it? I said sure, particularly if I could continue living in Colorado. We moved the headquarters from Boston to Colorado. Then about 13 months ago we rebranded and renamed everything we do to PeopleForBikes. We’d started the PeopleForBikes campaign because we knew bicycling was missing the clout of having millions of supporters. Too many elected officials, members of congress, state level officials still think bicycling is a nice thing, but frivolous. That it doesn’t benefit anybody but the people who ride and ride passionately. We’ve still got a long way to go, but I think we’ve done a good job of changing that perception. PeopleForBikes obviously has strong industry ties and partnerships with cycling teams and pros such as Tim Johnson. Because of that your transportation advocacy work overlaps with the sport and recreation side of cycling. 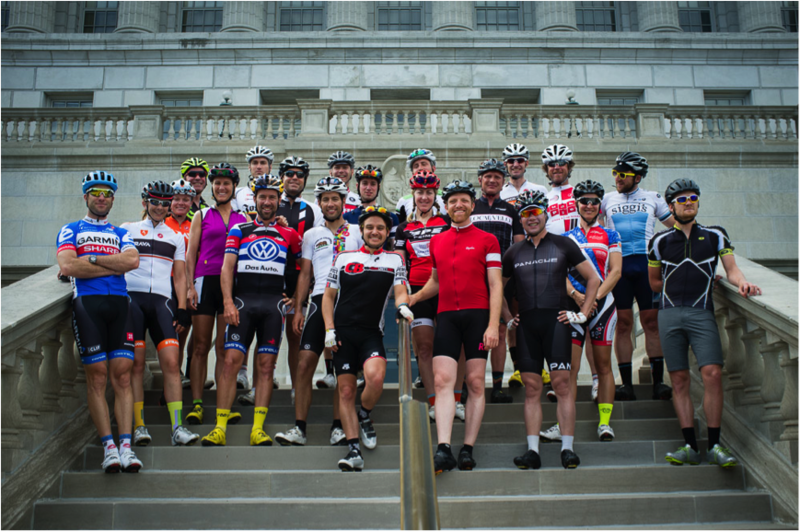 Why is it important to engage recreational cyclists and racers in transportation advocacy? It’s a good question. I would say no matter where you start in bicycling, as time goes by most people I know develop a broader and greater appreciation for the bike and bike riding and all of the elements of the tribe. There’s a commonality. Anybody riding a bike anywhere and anytime is a good thing. All kinds of great things happen [through riding]. It’s funny because a lot of the people I met 30 or 35 years ago were involved deeply in bike racing. I did seven Olympics for NBC on their cycling coverage and I was really into the racing side. But I would say I’m not the only one who thinks absolutely every aspect of bicycling is great. Just the simple act of getting on a bike almost always clears your head and clears your attitude. I’ve always resisted the divisiveness of narrow identification. I think there’s so much potential for everyone who rides a bike to come together in a basic way to celebrate and rally around all the great things that happen and do it together in a way that makes every element better. The longer I’ve been involved, the more I appreciate every aspect and the more potential I see for all of us to work together. That’s certainly in line with your campaign to get 1 million people signed on to the PeopleForBikes mission. Tell me more about that 1 million campaign. Is it primarily to build a unified mass of support behind you when you lobby governments and Congress? There are a lot of good things that come out of this base. It starts at the local level. We have close to 80,000 people in California, for example. There always will be issues, not only in San Francisco and Los Angeles, but statewide. If we can communicate those issues to a large group and help them act quickly and efficiently and without a big commitment of time, there’s a lot of power in those numbers. The basic point is that in a country of 320 million people, a million is still a big number when it comes to elected official perceptions. When you say you have a million supporters and you can back it up, that gives you a lot of clout and a lot of influence. It’s local, it’s state, on occasion it will be national. Frankly the biggest stalemate we have when it comes to support for bicycling is in Washington and primarily because they’re struggling with funding overall. When we hit 1 million near the end of this year then go towards 2 million, I can tell you the combination of representing the bike industry, all of the bike retailers who are mainstreet small businesses, all of the individuals who like bicycling, then all of the mayors and other people who don’t even ride but see the benefits, it’s a pretty powerful package and it’s a big improvement over where we were historically. Right now in bike advocacy you need to rely heavily on those people who identify as passionate cyclists, whether it’s racers or recreational cyclists or people commuting around town. For some advocates though, a big goal is to get bicycling as transportation to the point that it’s not an identity the way it is now, but is just a form of transportation the same way someone might ride the subway or the bus or drive to work. Is there a time in the future where cycling as sport and transportation are separate things in the US and don’t need to rely on each other? You make a lot of really good points. When we created the PeopleForBikes brand four years ago, one of our primary goals was to change the face of bike advocacy: to make it friendlier, more approachable, less intense. One measure of our success is that between 65 and 70 percent of our individual supporters are not involved, or when they came to us were not involved, with any other bike organization. We’re a portal. We get people in with a clear and simple message and a friendly look, then one of our goals is to elevate their level of interest and commitment. The other thing is we don’t use the word cyclist much. We think that bike riding should be something that anybody can do just about any time in just about any place without self-identifying as a cyclist. One really encouraging thing that happened this year was we partnered with Trek Factory Racing in the Tour de France. It was amazing how supportive the racers on that team were once they understood the goals and the reason behind PeopleForBikes. They may be elite and on the surface seem fundamentally different in what they do on the bike than commuters or transportation-oriented bike riders, but they all have wives and kids and parents and relatives who they want to be able to ride. They want them to be safe. They get that we’re all in this together and that they can leverage their prominence and media exposure to support those goals. I don’t see it going back. I see it coming closer together. Looking at the big picture, what’s happening in American bike advocacy right now that’s working really well? The most exciting thing is the growth of bicycling in big cities and the support of mayors. What’s changed in the last three or four years is the mix of cities where this is happening. At first it was places like Portland and Seattle and Boulder and Davis–what I would call probable, livable, liberal cities. But now, to me, the most exciting thing is cities like Atlanta and Memphis and Houston. Even Los Angeles and of course New York and Chicago. Making bicycling better there is daunting. It’s a combination of better bike infrastructure with a focus on protected bike lanes, bike sharing systems that are being well used, support from mayors, and it’s all being backed by pretty wide support. We’ve got economic research that shows that businesses near protected bike lanes actually grow and benefit. There’s a high level of approval from citizens. Sure in New York and Chicago and Seattle and just about anywhere there’s a fair amount of pushback and rancor in the media, but I view that as a normal aspect of fundamental change. I’m just really optimistic about where bicycling is going in cities. It’s so cost effective. It’s an investment, but it’s a cost-effective investment. We have a goal for everything we do called 5X. Basically there are certain categories we want to grow by 500 percent in the next 10 years. I feel really confident that the amount of bike riding in cities is going to meet that goal and maybe even exceed it. To go from 1 percent [of the national mode share] which is basically where we are now to 5 or 6 percent would make a big difference to quality of life and transportation and everything in cities. Not just for bike riders, but for everyone. There are, of course, a lot of different pieces of bike advocacy. What are of the most important things bike advocates around the country need to be doing to get more people riding? There are so many things. There are some that are somewhat within our control and some that are really daunting. One of daunting things that I worry about is tension on the road between motorists and bike riders. I don’t know that we have the power to address distracted driving, stressed driving. We do have the power to encourage bike riders to be predictable when sharing the road with cars: to signal, to stop at stop lights, to not go out of their way to infuriate motorists. The other thing that makes the work of advocacy really tough is that this is not an especially good time for government fiscal balance sheets at any level. Five years ago things were really bad. They’ve gotten better because tax collections have gone up and governments have been relatively conservative about spending. But better places to ride do cost money. Not much, but it’s going to be really important for advocates to effectively, efficiently, and concisely make the case for why these investments need to continue. A key point is that it’s not about us. When we’re talking with the government or media it’s not about making investments to make the riding experience better for us, the people who like to ride bikes. It’s equally or more about all the other benefits that will accrue for everyone in society if bicycling is well supported and promoted. Stuff that doesn’t really resonate right now even though it should such as the costs governments incur to deal with people who are completely sedentary, the costs of diabetes, long term health issues related to the inability and unwillingness to move, time stuck in traffic. Vehicle miles traveled has gone up in the United States for the first time in years. I believe it’s up 2 percent and that’s a big number. We’re talking about 2 percent on top of 400 billion trips that Americans make in a year. That 2 percent growth means that existing roadways are under stress and pressure. People are going to waste time stuck in traffic. It builds frustration, it reduces productivity, and it’s a really daunting problem. Where’s bicycling in America’s going to go from here? Like I said, I’m very optimistic. And I think optimism has to be part of our movement. I believe bicycling is going to get better. I mentioned protected bike lanes, but I also think bike parks where you take a small piece of acreage and turn it into a place for people of all ages to ride, that’s a really good development. I think a lot of these fundraising rides that raise money for charity and inspire people to set a goal and ride more, that’s really working. I think that bicycling is slowly, but steadily becoming mainstream in the United States. Less like Steve Carell in the 40 Year Old Virgin where he’s portrayed as a loser because he rides his bike. 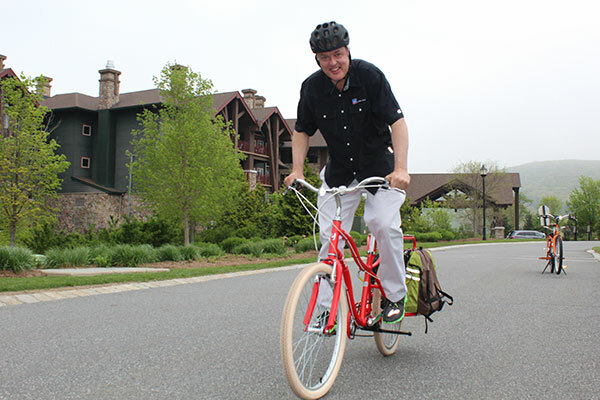 The image of bicycling is slowly and widely improving and changing. I think celebrities help us, pro athletes in all sports who ride help us, I think that people riding in suits and dresses and heels help us. I also think the diversity and equity story, that show it’s not just a recreational sport for affluent white baby boomers, is key. There are a lot of good stories that we’re telling and they’re starting to resonate. Five or ten years from now, bicycling in America is going to be better, safer, more appealing, and more fun than it is now. This entry was posted in Advocacy, Bike Industry, Interviews and tagged american bike advocacy, bike advocacy, greelane project, IMBA, people for bikes, peopleforbikes, protected bike lanes, tim blumenthal, tim johnson. Bookmark the permalink. In other words, let Motorists have their way unless there is infrastructure in place to get cyclists out of their way? You will never have more complete infrastructure in place than the existing system of roads available to ALL vehicles, not just motor vehicles.